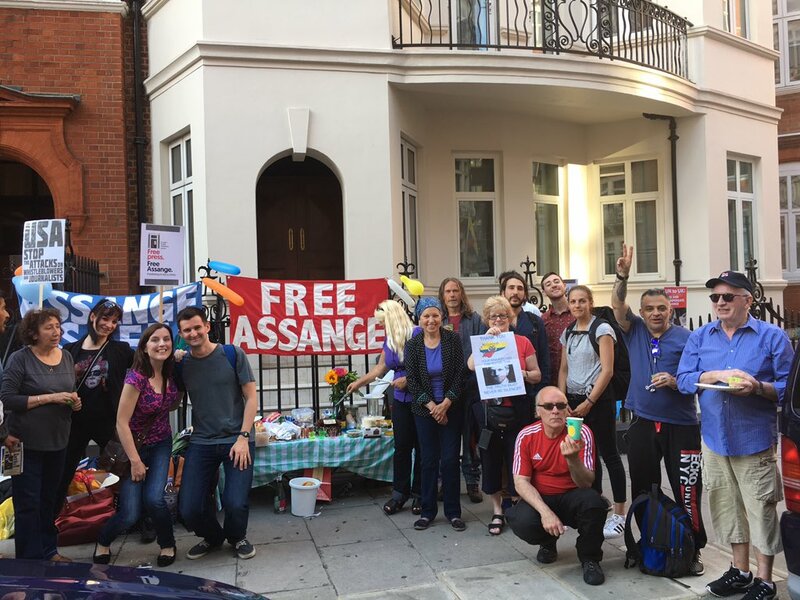 On the beautiful day that Julian Assange turned 46, there were so many messages of love and support from around the world. Starting out with his Mother who we all owe a huge debt of gratitude for planting the seeds of thoughts that could change the world in our hero from so young. At the appointed time of 6 pm, so many people were outside 3 Hans Crescent with tons of food, several cakes, ice cream, live music, signing cards to wish our hero well and we sang Happy Birthday at least three times. 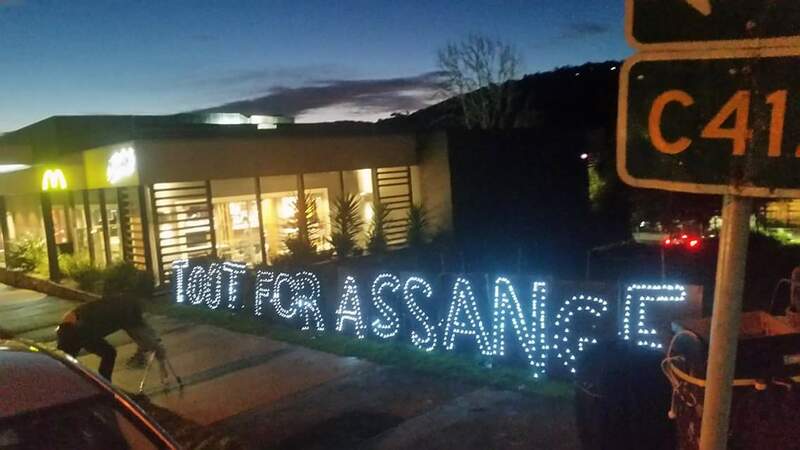 People from England, Ireland, France, Columbia, Chile, Ecuador, Australia, Canada, the USA, so many countries and all united by our love and admiration for Julian, knowing the tremendous sacrifice he makes daily for us all. He has not had sunshine or fresh air in 5 years. As we are standing in solidarity with him, we share the truth of Wikileaks and Assange’s arbitrary detention with passers by. So many people stop and take a selfie in front of his balcony, so they know he is there. We share in how the UK government will arrest him if he steps out. Also how tremendously grateful for the country of Ecuador is to stand up and continue his asylum. We all joke, make light, hope for the best, erstwhile knowing how strongly the US wants to extradite him. I personally would love to see countries like Australia and the UK stand up to my country and see the horrendous crime they’re committing by disregarding his human rights being used as puppets to do my country’s dirty work. I am writing this on the train to Paris, but my heart is ever there, due to meeting, making friends with some of the warmest, most courageous people ever. If you are in London, stop by the vigil, your life will expand immensely because you can literally feel the making of history. Most of us are the politically disenfranchised from our countries, and somehow that brings such a unity of purpose. We want him to be free and back with family and friends. #SafePassageforAssange (to Ecuador) is what we need. Gallery | This entry was posted in Assange, WikiLeaks and tagged Arbitrary Detention, Ecuador, Julian Assange, WikiLeaks. Bookmark the permalink.